•	A Directory of Resources for UV Sterilizers, Sterilization, Irradiation, and Replacement Bulbs for use in Aquariums and Ponds. 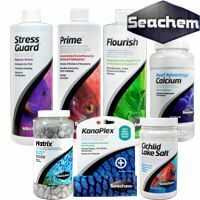 *Ultra violet sterilization is one of the most effective means of controlling algae in ponds and is also effective at disease prevention in aquariums (marine and freshwater) and ponds and not just by means of sterilization, but by the action of UVC light irradiation upon oxidizers in the water column that would otherwise lower fish immunity (thus providing a more balanced Redox. *UVC is used in home/business air purifiers, sterilization wands (that take the place of harmful chemicals). *As well more is being proven about the use of UVC in blood treatments of humans to act in a similar way as an antioxidant, to which this has many implications for use in fish and other veterinary purposes. • UV Sterilizer Maintenance (such as quartz sleeve cleaning). • Rebuttal to a false article about UV Sterilizers in aquariums. • Blog articles (posts), comments, and links to even more Information about how UV (UVC) Sterilization works in aquariums and ponds. This is a great site to check regularly for new posts. • Pond UV Sterilizers vs. Aquarium UV Sterilizers; is there a difference? Excellent graphs and diagrams to better explain UV Sterilization as well installation diagrams as well. *Germ-Guardian 9 Watt UV Bulbs. A good site for a basic overview of UV Sterilization as it applies to Aquariums. A very interesting educational site that explains Atmospheric Physics; uva, uvb, uvc, and ozone. *Are UV Sterilizers Good for an Aquarium? Pocket Purifier- The Purely Pocket Purifier destroys household bacteria and viruses using UVC light energy and NO harmful chemicals. BioZone makes several popular UVC air purifiers such as the 100 Home Air Purifier; 3000, 4000, & 5000 Office & Home Air Purifier; Induct 1500 & 2500 Air Duct Air Purifier; 300FS & 400FS Food Service Air Purifier; & the 200R Restroom Deodorizer & Air Purifier. The T-5 #PUVLF210, four pin 10 Watt L Series UV Bulb above fits these popular purifiers. Other popular home air purifiers include the Sharper Image Ionic Breeze which requires the G15T8 15 watt UV replacement bulb; as well as the CaluTech Air Purifiers of which the two most popular models require the CaluTech 18 Watt UV Bulb or the CaluTech 36 Watt UV Bulb. This unique pond information site provides up to date resources and information not found on many other pond sites, including to links to Veggie Filters and Pond Algae sites. Of importance to readers here, this site gives UV Sterilizer/Clarifier installation information that is first rate. Although not about UV/UVC Sterilization, it is a related subject in a fast growing segment of technology. This IS the internet's premier source for researched aquatic lighting information; from Kelvins, PAR, Lumens, to lighting types (such as MH, LED, SHO, T5) and MUCH more. What Does a Patented Aquarium Sponge Filter Mean? 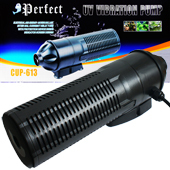 Aquarium and Pond UV Sterilizer Articles -Blog Style Articles about UV Sterilization.